The Father says today, enter into the finished work of the cross. Waiting for Me to do something further than what I accomplished upon the cross is misdirection. When I gave Heaven’s best in the person of My Son to you, I left nothing out. With Jesus, I gave you all things that pertain unto life and godliness. It is up to you and up to your faith to draw upon and gain access by radical trust and audacious acts of obedience to all that heaven affords. I am not holding out on you. You are not standing idly by waiting on something that is already yours in the finished work of Calvary. Step out in expectancy that My word is true and My promise sure. When facing a challenge, do what I would do if I were in your situation – because I Am. I Am in you, and you are in Me. You and I together constitute a majority no matter how many things are moving against you. It doesn’t matter if you aren’t strong enough or smart enough to know what they will do next. Why are you worried about an enemy I have already defeated? Why are you concerned about the losing team or what they plan next? You are more than a conqueror. Go out in your day and act in faith rejoicing that all that I have promised will be your testimony err the sun goes down! 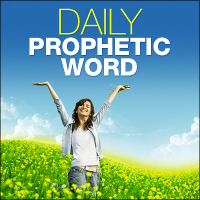 BLESSED prophetic words todAy Monday September 17, 2018. It’s all about CALVARY & what our SAVIOR JESUS CHRIST has done for us & HIS very important WORDS. Holding onto it we can’t go wrong because it’s all very real for those who believe. AMEN AND AMEN AND AMEN for JESUS CHRIST FINISHED WORK AT CALVARY! Thank you sir/madam for daily prophetic words. Praise God, iam happy to tell what God has done iam healed and i tested negative thank-you for prayers may God bless you and enlarge your ministry greatly in Jesus name Amen.